Sri Joydip is an International Yoga Teacher, who taught Yoga in International Institutional bodies like US Consulate and American Library, Corporate bodies like Birla Corporation Limited , National Small Industries Corporation, Eta Maelco ( Dubai). Sri Joydip’s mission is transformation of human race to divine race , by creating more equality, harmony , peace and new level of inner learning, through teaching yoga and spirituality, for health and wellness, and broad base social transformation eradication some of the social evils through new age learning tools on Yoga. Sri Joydip has his education in ‘Yoga and Psycology’ from Sri Aurobindo Centre for Advance Research , ‘Creative writing’ from British Council, and ‘Management’ from Indian Institute of Management , Kolkata and ‘Reiki Healing’ from Reiki Kendra, “Mindfulness and Peak performance[ Online] ” from University of Monash . He has a 30 years of Yoga practicing and 15 years of Yoga teaching experience. Sri Joydip has written six published books in Yoga and spirituality which are all available in Amazon – ” Wisdom Stimulus – Application of Bhagvad Gita in Self Management ” , “Living the truth” and “Living Well”, “Seven Yoga Habits that can Transform your Life”, “Creatiyoga” , “Lifewise”, “Gyan Yoga Teachers Training “ . Sri Joydip has also written numerous article on Yoga which have been published on Speaking Tree, The Complete Herbal Guide Magazine , Cure Joy , Zenward and .BYR blogs. In 16th April , 2017 , International Federation of Yoga professionals , honoured him for his work on “Yoga for Attention Deficit and Hyperactivity disorder” for school children’s which he started working with a project called “Young Minds”. Later in 2018 , he started an online course for school children’s on “Yoga for ADHD” where he taught to basics of management of ADHD, through new parenting and teaching strategies, which is attend by students and parents of different schools. Last 15 years, Sri Joydip is teaching yoga to share some of divine gifts, he has received for using Yoga for health and Wellbeing, and transforming human beings into Divine Being. Sri Joydip loves writing on Yoga, and he has almost 6 Paperback/E-books on Yoga , numerous articles on blogs and also many videos, telling different aspects of Yoga. His unique Intellectual and creative contribution on the field of Modern Yoga , connecting it with modern research in Psychology , Neurosciences and Mindfulness for helping in different works of life lead to 8 Intellectual properties registered with copyright department of Government of India . This unique creative and Intellectual contribution which has IP protection, is disseminated by Sri Joydip Ashram Public and Charitable Trust , through Sri Joydip Ashram Online Yoga Varsity by 30 online courses for beneficiaries from people of Ten countries on transforming there lives. The ‘Instructor lead learning’ process also also uses this Intellectual properties , by licensed trainer on this Intellectual properties, in Sri Joydip Ashram Gyan Yoga Training and research centres, transforming communities and creating a new quality learning standard on Yoga. 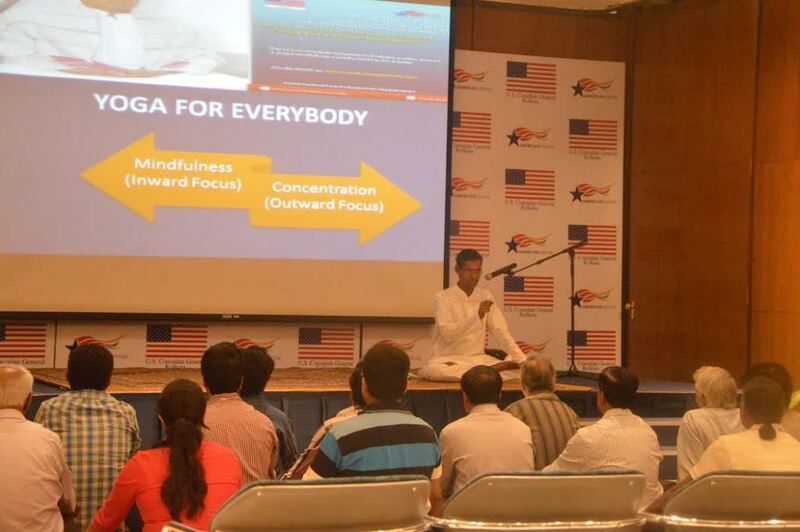 From 2016 -2018 , Sri Joydip started taking classes on yoga, to different International Institutions like American Council and American Library, and also into different civil societies like Tollygunj Golf Park Residential Association , International Federation of Yoga Professionals , DST . International students across the world, started coming to him from US, Denmark , Estonia ,France , Sweden , Romania and Israel. His research on ‘Yoga for ADHD’ for schools students also got praised and honoured by International Federation of Yoga Professionals. In 2014 and 2015, he was the secretary of the Organising Committee, of World Yoga Festival 2014 in Burdwan, and World Yoga Festival 2015 in Tiruvannmalai , which is jointly organised by Sri Joydip Ashram and Eastern India Yoga and Spiritual Organisation Association, where he have many different yoga school participated, and exchange their thoughts and views on Yoga. On 2015, he did 2 online courses from 2 International Universities in Australia (Monash University) and Russia ( University of Aberdeen) on Mindfulness , Peak Performance , Food and Nutrition along with Well being . This courses helped him to connect his knowledge on Yoga with mindfulness, Nutrition , Food habits and create programs like Wellness Program , Workplace Wellness Program which help many students to live well , become happy and have a general sense of Well being. From 2013 onwards , he started regularly publishing articles in Speaking Tree, and many other Yoga journals, across the world, on Yoga, which includes The Complete Herbal Guide Magazine , Cure Joy , Zenward and .BYR blogs.. In 2013, he also joined the ‘Yoga Teachers Training Workshop’ with Ramkrishna Mission Vivekandanda University, as a Yoga Filmmaker, in Assam and created two films on ‘Yoga as Medicine ‘ and ‘Yoga for Wellness’ on the application of Yoga on Medicine, and the application of Yoga on Human Wellness. ‘Yoga as Medicine’ was highly praised and selected for screening in Kolkata International Film Festival 2013. In 2012 , he went into a deeper search and sadhana on Yoga for one year . That year , in the meditation with Sri Dakshinamurty (who is known as Adi yogi – the first yogi), in a temple in Tiruvannmalai , a system of Yoga is revealed to him , how we can connect with the energy of ‘inner sun’ with a group of mantras , pranayamas , Surya Kriya and Asanas . Surya yoga alongwith Surya Kriya and Surya Dhyana formed a part of system of Yoga , which is referred as “Wellness Yoga” and which helps on mindfulness and building awareness that could heal disease , create a sense of wellbeing and make people happy. . He started teaching Surya Yoga from 2012 onwards, and he initiated many students across the world , on this system of yoga, both online and offline. From 2010 , he restarted teaching yoga, more regularly on banner of Sri Joydip Ashram, mostly taking reference of Bhagvad Gita’s yoga and its application in Management and Maharishi Patanjali’s Yoga sutras. In the period of 2008-2011 , Sri Joydip did complete his course on “Yoga and Psychology” , from Sri Aurobindo Centre of Advance Research ( SACAR) and he then went to publish his first book connecting the Yoga of Bhagvad Gita with Management which was titled “Wisdom Stimulus “. He later visited Management colleges across India, from Motital Rastogi School of Management ( Lucknow) , Management Colleges in Bangalore which are member of MTC Global ( Bangalore), Mahatma Ghandhi College of Management ( Guntur) , Dhrubha School of Management ( Hydrebad) and taught how the Yoga of Bhagvad Gita could be applied to Management. At 2004 – 2007 , Sri Joydip started teaching positive psychology , entrepreneurship and Business planning in Indian Institute of Management , Kolkata and he continued teaching for next 3 years. He also joined International School of Business and Management , as an adjunct faculty and taught positive psychology, assertiveness, change management and Yoga to the students of Management. .
At 2003 ,after a years of spiritual sadhana and study , and he started teaching Yoga and positive psychology both in Individual and Corporate level. At that time , he taught Yoga in Birla Corporation Limited in Birlapur and also in NSIC apart from teaching regularly to Individual students..
Lifewise Program ( General ) – 24 hrs – 12 days [ 2 hrs each day] – The program teaches Surya Yoga , Surya Kriya , Surya Dhyana and Wisdom Points on Wellness. Creatiyoga Program – 24 hrs – 12 days [ 2 hrs each day] – The program teaches Surya Yoga , Surya Kriya , Surya Dhyana and Wisdom Points on increasing creativit. Seven Yoga Habits that can Transform your Life – 24 hrs 12 days [ 2 hrs each day]– The program teaches Seven Yoga Habits that can transform the life. .Gyna Yoga Teachers Training (Guru Poornima) Retreat ( Tiruvannamalai) 48 days and 500 hrs – Spiritual Retreat Program with Advance Research on Yoga and Advaita Philosophy.